This morning was business as usual after an incredibly intensive week last week, which included a full day rehearsal and two workshops. Despite this our members were full of as much energy and enthusiasm as always. Today has been one of the busiest in “Musical Arc” history, with two workshops in one day. The members joined us as we rocked up to the Vine for the second workshop of the day. 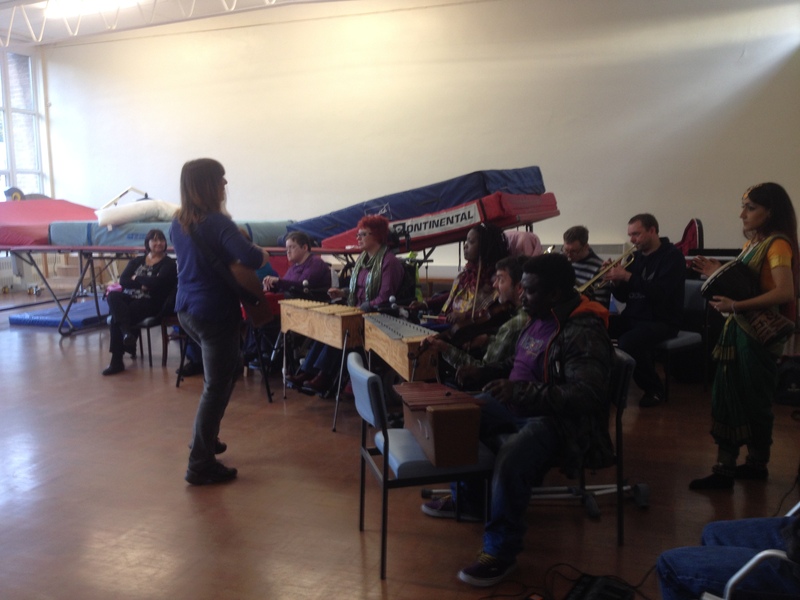 Twenty-five 16-19 year olds attended our workshop to make music with us. The session went really well and staff were amazed at how engaged the students were throughout the whole session. 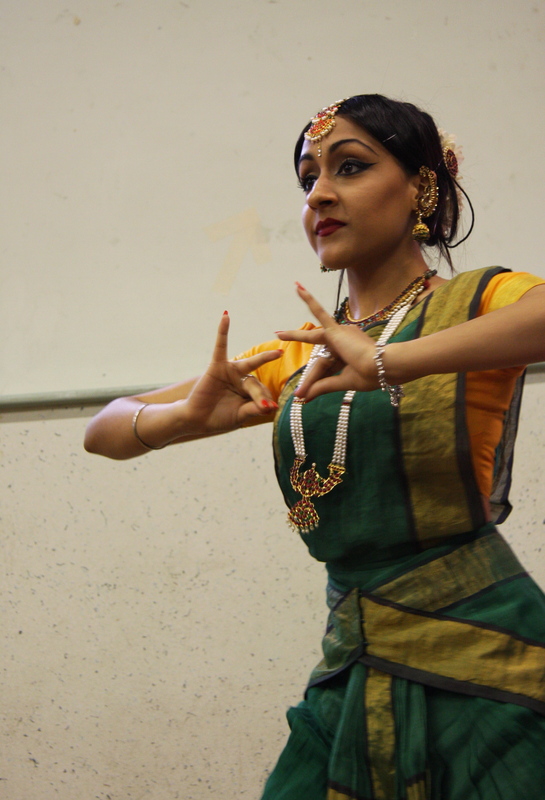 Dilrani performing an excerpt of “The mango Tree”. Musical Arc is now half way through the autumn workshop season. With two workshops down, and three to go, it has been an inspiring couple of months. I am continually amazed at the dedication of all the Musical Arc members, volunteers and staff. We are very fortunate to be surrounded by such talented and generous people. Today, we were also pleased to welcome a new volunteer and wonderful Flute player to our ranks, a big welcome to Carmel. Great to welcome everyone back to “the Arc” for another brilliant session, preparing for the continuing “Mango Tree Workshops”. 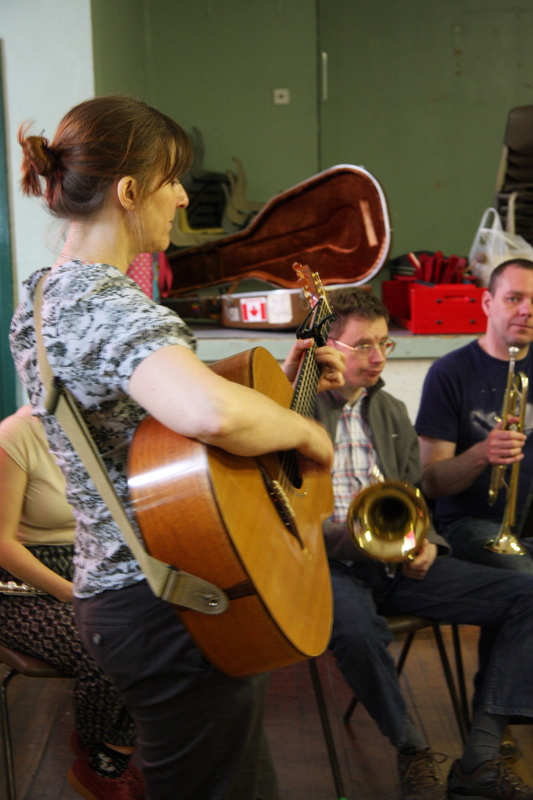 Our Musical Arc members are improving and shining with more confidence at every rehearsal. There was an atmosphere of jubilation after the success of last week’s “Mango Tree” workshop. On a sadder note, last week we said a bitter sweet farewell to Andrew Wilson, who has been an invaluable member of musical arc for many years. 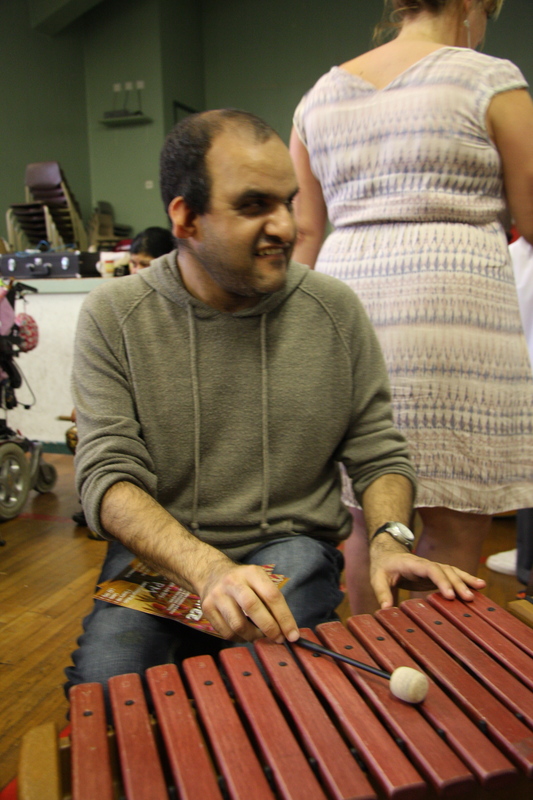 Everyone at Musical Arc wishes Andrew the best of luck in his new job. At 10:15 Andrew, Shehnaaz and I stood awaiting a taxi, huddled against the rain, talking excitedly about the day to come, in high spirits despite the discouraging weather. As we arrived at Leeds Federated Housing we received an enthusiastic welcome at reception, with much attempted nosing in our bags to see what goodies we had brought along. Arthington Hall was our venue for the day and I was personally delighted to spot plates piled with pastries and jugs of juice waiting for us in the corner. Dilrani captivating the audience at the first “Mango Tree” workshop. We kicked off with “Indigo” a poignantly beautiful creation written by and performed by all musical arc members. This was the first time I had heard this piece in its entirety and was blown away by the beauty of the interlinking melodies and the confidence shown by our performers. We moved onto an excerpt of “The Mango Tree” and I was utterly captivated by the enthralling story told by Anita. 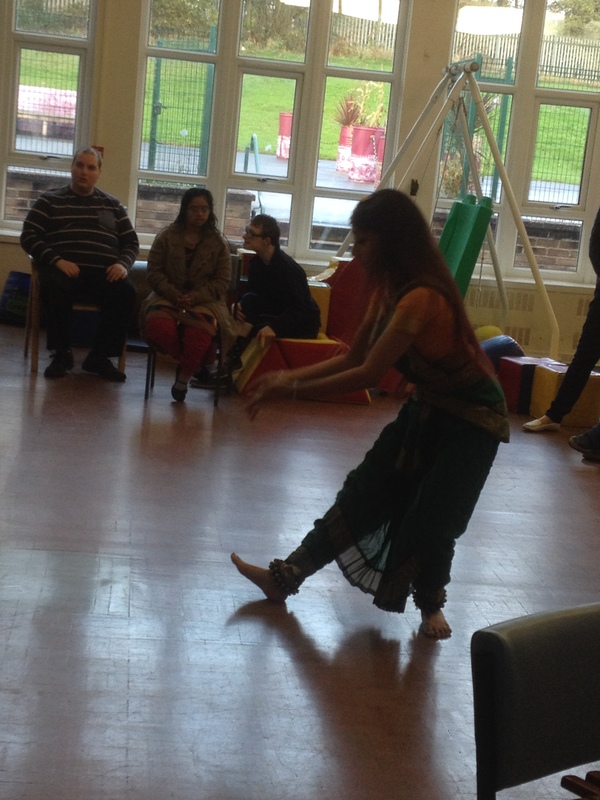 Anita’s lyrical intonation brought to the story to life complemented by Dil’s fluid, interpretive movements. During a celebratory moment of the piece we invited workshop participants to join us to learn a jig. Several audience members hesitantly got up, accompanied by much nervous giggling, but relaxed as the steps became familiar. After much bumping into each other and tripping over we eventually found our feet and I saw my wide grin mirrored on the faces across from me. The fiddle and drums joined in and the dance drove onwards, full of joy and exuberance. The last section was, for me, the highlight of the day. Musical ARC Members and audience alike sat in a circle and formed an impromptu musical jam. Each person created their own melody which interweaved and developed. This was an excellent example of the inclusiveness of Musical ARC as all participants felt comfortable enough to put forth their own ideas and melodies. This was an uplifting and inspiring start to musical arc’s autumn workshops. 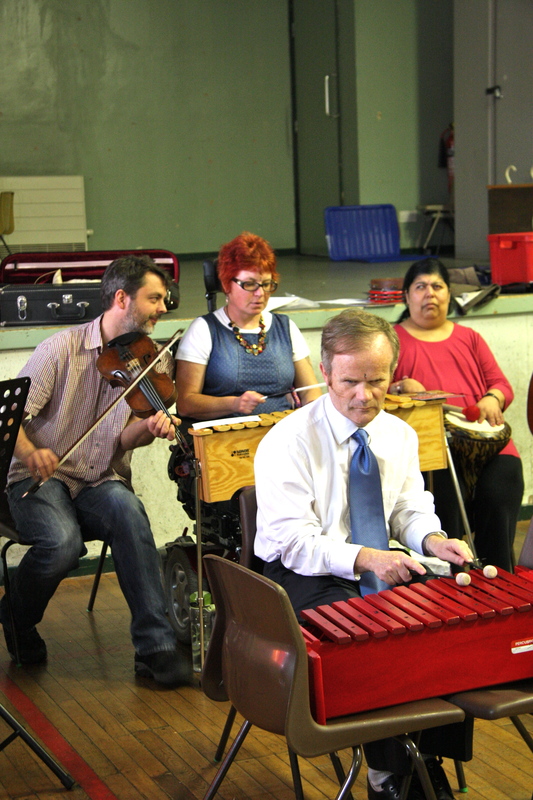 Today Meanwood Community Centre saw the second week of the Musical Arc rehearsals and the pace has really picked up. All the members’ hard work shines through in their playing, I for one am extremely excited to be part of the first “Mango Tree” workshop next Monday. Musical Arc member’s hard at work.